The chances of sealing a deal on Britain's withdrawal from the European Union this month are receding, Taoiseach Minister Leo Varadkar said today. Mr Varadkar's comments come as the EU's Brexit negotiator called on Britain to make decisive choices. The leaders had previously pencilled in a summit for mid-November to sign off on a deal with London. Negotiators from both sides, however, remain at odds over ways to guarantee there is no return of border controls on the Northern Ireland border. "But we do have one scheduled for the 13th, 14th of December, so not getting it done in November doesn't mean we can't get it done in the first two weeks of December," he said. "But I think beyond that you're into the New Year, which I think wouldn't be a good thing," Mr Varadkar added. EU negotiator Michel Barnier, who also met Mr Sipila, said it was impossible to say when the divorce talks would conclude, adding that there would be no deal without a solid fix for the Irish border. "We are not there yet. The clock is ticking. The choices need to be made now on the UK side," he told reporters. "There are still important issues outstanding." Brussels has proposed a "backstop" arrangement as part of the withdrawal agreement that would ensure an open border by keeping Northern Ireland inside the EU customs union and large parts of the single market. Britain has complained this would create a border in the Irish Sea between Northern Ireland and the rest of the UK. "Without a backstop there will be no deal. It is as simple as that," Mr Barnier said. "It is clear that more work is needed in Brexit negotiations. We remain determined to reach a deal." Leo Varadkar spoke to British Prime Minister Theresa May on Monday, agreeing that any backstop should be temporary. May also told him that there would need to be a mechanism to end it. Mrs May also today spoke to the President of the European Council, Donald Tusk, to discuss the next steps. EU envoys in Brussels will get an update on Friday and then ministers from the 27 European Union states are due to meet on Monday. "For me, it's always about the objective, more so than the mechanism - what are you actually trying to achieve," Mr Varadkar said today. "We hope that the backstop will never need to be used, it is an insurance policy," he stated. Mr Varadkar said he was willing to consider a review clause attached to the backstop, but this could not allow Britain to withdraw unilaterally and leave a hard border. 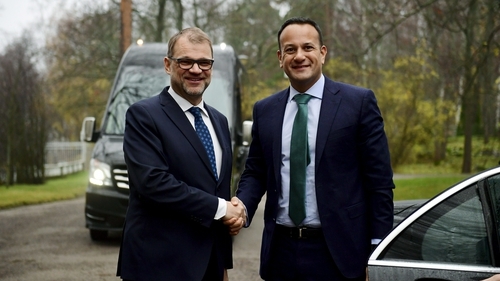 The Taoiseach and Mr Barnier were in Helsinki to attend a two-day congress of the European People's Party.